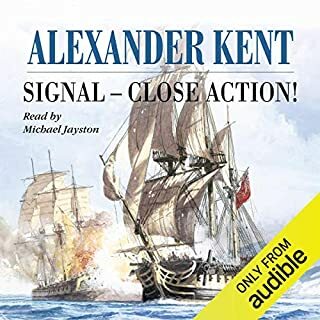 ©1971 Alexander Kent (P)2014 Audible, Inc. This is another great adventure and yet as original and different in its plot, its action and twists and turns as all the others in this outstanding series. As subtle and moving in parts as it is gripping and exciting in others. Very well put together by the storyteller and author. Lots going on to keep you affixed to this salt going saga. little room for disappointment in my liking and plenty of depth! 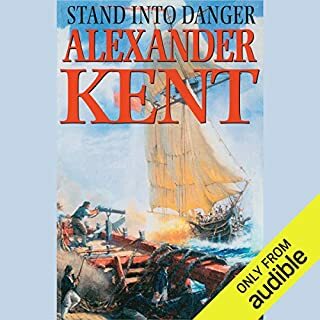 This series is written by Alexander Kent a pseudonym of Douglas Deeman, who is a well known writer of Royal Navy stories from 1700 to the 1940’s. The series is about Richard Bolitho and I think this is book 11 in the series. Unfortunately I have not read them in order. This story has Richard Bolitho in command of the 100 gun Euryalus (a French build ship, he had captured from the French in a prior book). He is the Flag Captain under a Vice Admiral who is inflexible and rule bound. 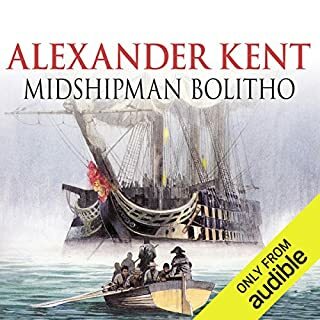 The story opens with “The Great Mutiny” and Bolitho is asked by mutineers on another ship to plead their case with the Admiral. The leaders are hung and the cruel Captain is but back in charge. They are then off to the Mediterranean to capture a Moor fort, fighting Barbary corsairs, the French fleet with lots of suspense, swashbuckling action and naval tactics. Some general information about the Royal Navy of the day is given and the general feel of life in the RN in the 1790 is provided. 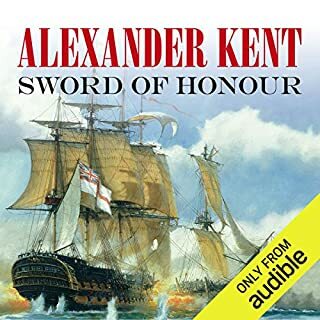 I feel the books are not as well written as those of Patrick O’Brien or C. S. Forester but if you enjoy a good sailing story of the Royal Navy fighting the French you will enjoy this series. Michael Jayston does an excellent job narrating the story. Absolutely wonderful. Captain Bolitho truly, would be a man to follow and to respect. Mr. Jayston brings the book to life! Great series to listen to. Better if all the books were available. But the story is a great series to follow. Great news to see more Bolitho Books released! 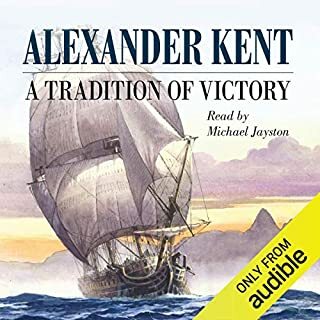 Of all the Audiobooks I have listened to, this Author & Narrator are my favourite! I have come to really enjoy the lengthy drives that are part of my job. The sheer escapism offered by the Bolitho stories is so relaxing! Now that some of the middle stories are being released it has enabled some of the gaps to be filled. Like so many of his stories, this one returns to Bolitho's earlier exploits & gives more background to some of the Characters that become so important later in the series.. It's a good tale and well told. 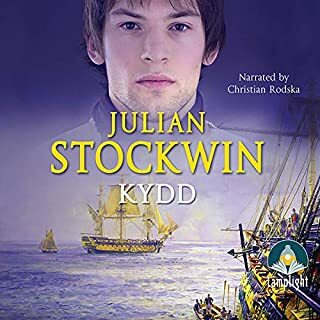 Patrick O'Brian has been compared to a seagoing Jane Austen.I agree.Alexander Kent is somewhere in between .In a previous review I mistakenly mentioned that I have over 20 of these books in audible.I own more and have listened to every unabridged version available by these authors.Why have they been and continue to be so popular ?? The characters and situations are based on on ACTUAL historical people and situations. Ships logs where required,Diary's were more common than not among ship's Captains and many officers so there are thousands upon thousands of written records,memoirs newspaper articles etc.This is a substantial resource for much of the material by these authors combined with their imagination,sailing expertise and the ability to tell a good story. The FACTS are that the Royal Navy was replete with Brutality,Politics,The Absolute authority of Captains,Promotion due to Family power,seaman that were kept on board for years at a time for fear they might run away[as well they might have] and Impressment of recruits right out of homes ,the streets and taverns. The Royal Navy was also replete with Bravery,loyalty to King and country,Crews that could out perform the enemy in number of Cannon Shots,discipline etc.and officers that were true leaders beloved by their men .These officers came both from the priviledged class and the ranks..promoted for their abilities. Because of the system of awarding Prize money based on the value of ships captured ,the lowliest crew member could retire to comfortable circumstances with enough to own a farm or small business.Many of the officers entered the service poor[the 3rd or 4th son not likely to inherit] and left the service wealthy prosperous men with substantial fortunes. NOW IF THAT'S NOT THE MATERIAL FOR GREAT STORIES ABOUT CONDITIONS THAT REALLY EXISTED AND SITUATIONS THAT REALLY HAPPENED I DON'T WHAT IS.!!!! 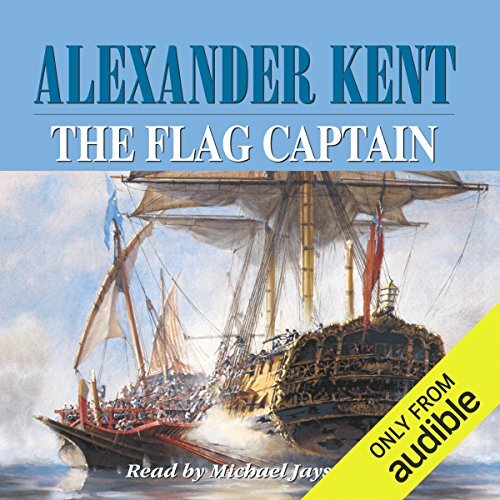 THE FLAG CAPTAIN is one such story.There are credible heroes,villains and flawed characters who seek and find redemption.Political intrigue at it's worst,the good and bad traditions of the Royal Navy,Naval Battles,Piracy,Slavers,Mutiny,Treachery,Loyalty.You name it and it's there.THE FLAG CAPTAIN is one example of the genre.It is a good story because Kent TELLS A good story and most important a CREDIBLE story because that's how things were back then and those things really happened,albeit maybe not all to one person.Michael Jayston is the perfect narrataor.His accents and inflections make you feel like there are several good narrators.Happy Listening ! !